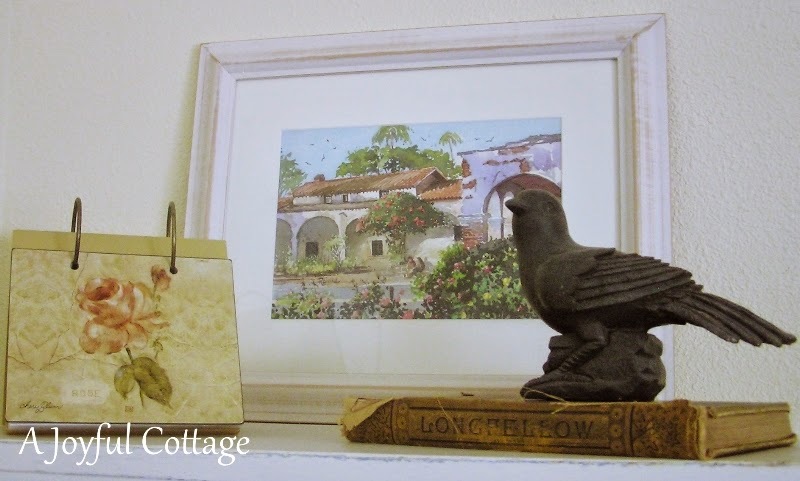 Today I'm joining the very talented Karen at My Desert Cottage for her 6th Annual Where Bloggers Create blog party. This is my first time at Where Bloggers Create, so I'm pretty excited. I feel very blessed to work in this large, bright room. In the middle of the room is a vintage dining table that I bought for $50 at a local shop. The veneer top was pretty beat up when I found it, but the rest of the table was in great shape and sturdy. 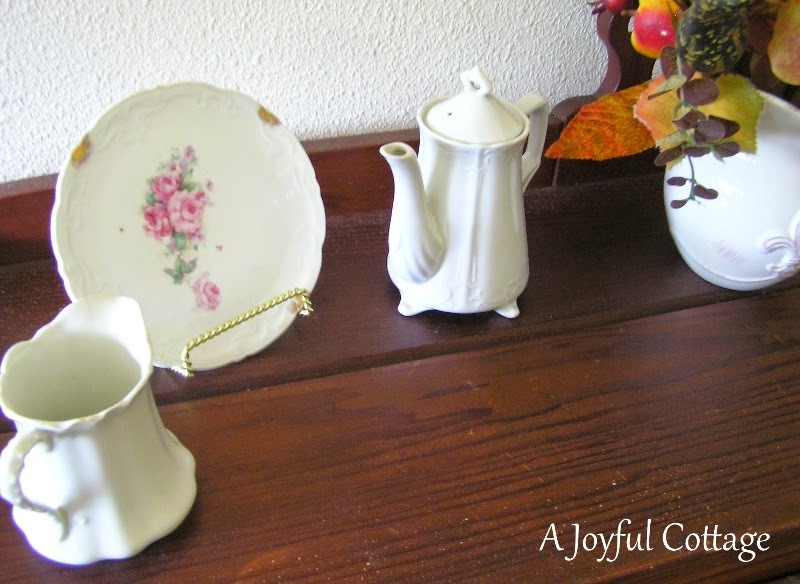 After some work on the top, white paint and a little distressing, it now functions very well as a multi-purpose table. 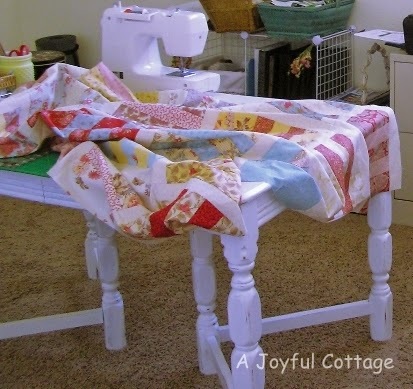 My portable sewing machine is easily removed to make room for fabric cutting or crafting. Currently I'm using the table to work on our new home's interior design. It's a great place to spread out. The other work surface in my room is a drop leaf vintage table. Here I write, blog and do the usual computer-related work. It's a very eclectic space. 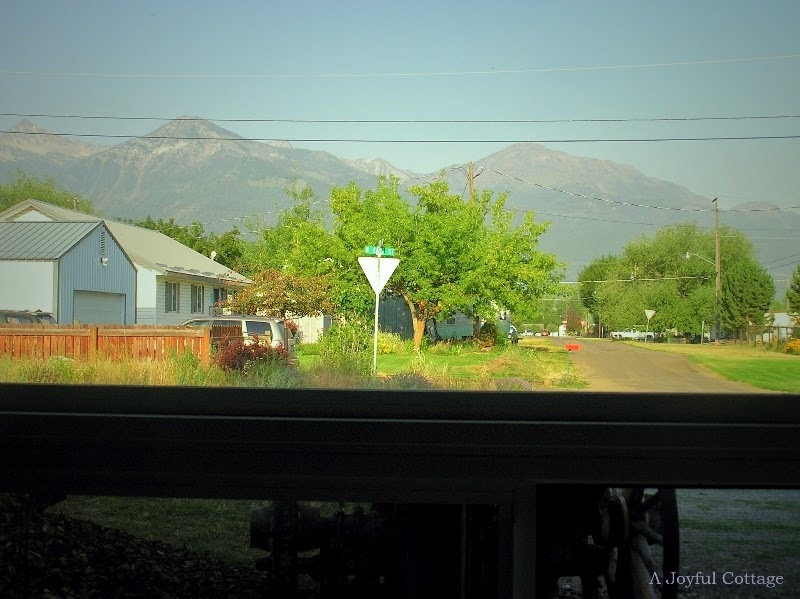 From here I have a view of the beautiful mountains and a funky old wagon which appears in the photo as a silhouette. In front of the window is a deep ledge. 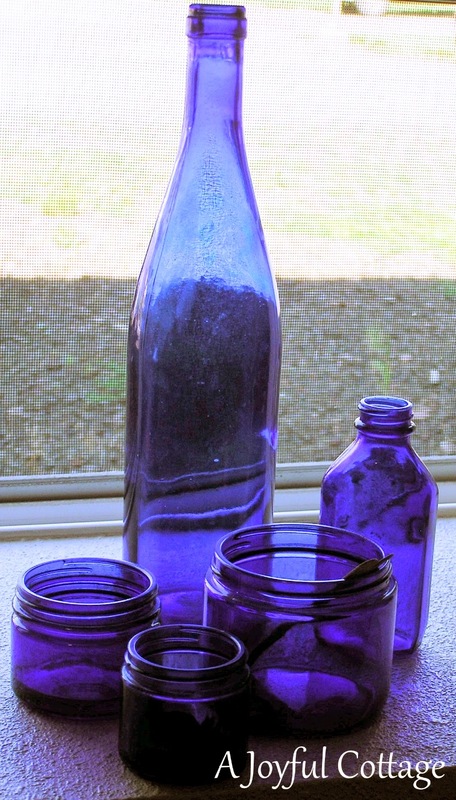 Here I display cobalt blue bottles and jars. I like the way the light plays on them throughout the day. Farther down on the ledge I've made room for family photos. This chippy upside down harp mirror frame is one of my very favorite vintage pieces. I dug it out of an antique warehouse, way in the back of the building, just as it is. All I did was remove the cobwebs and dirt. 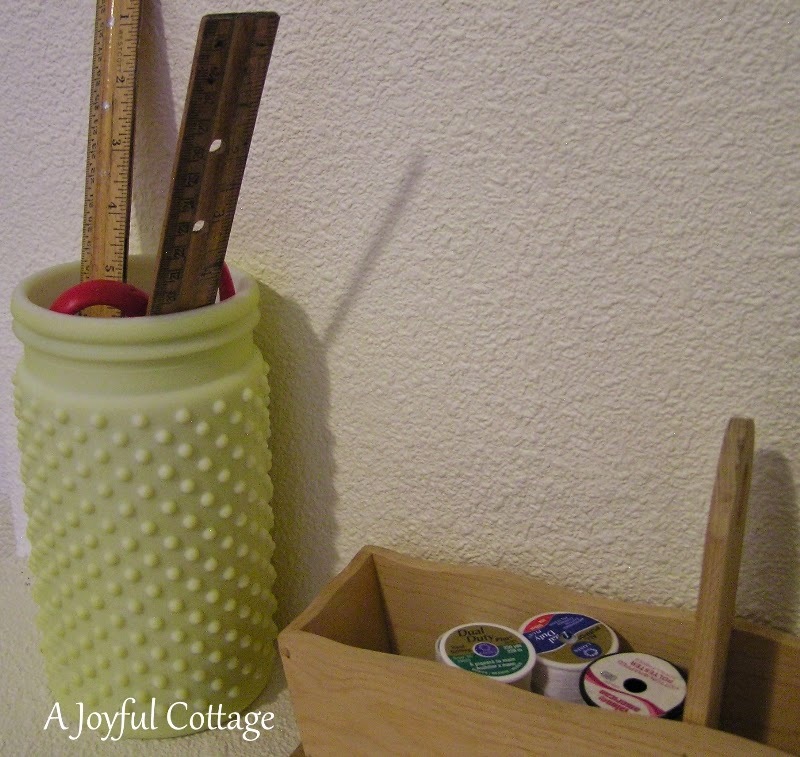 The ledge also serves as a place for my CD stereo player and craft/sewing organization. All my containers have been purchased at thrift shops and yard sales. I found the little jar of old buttons for 25 cents. 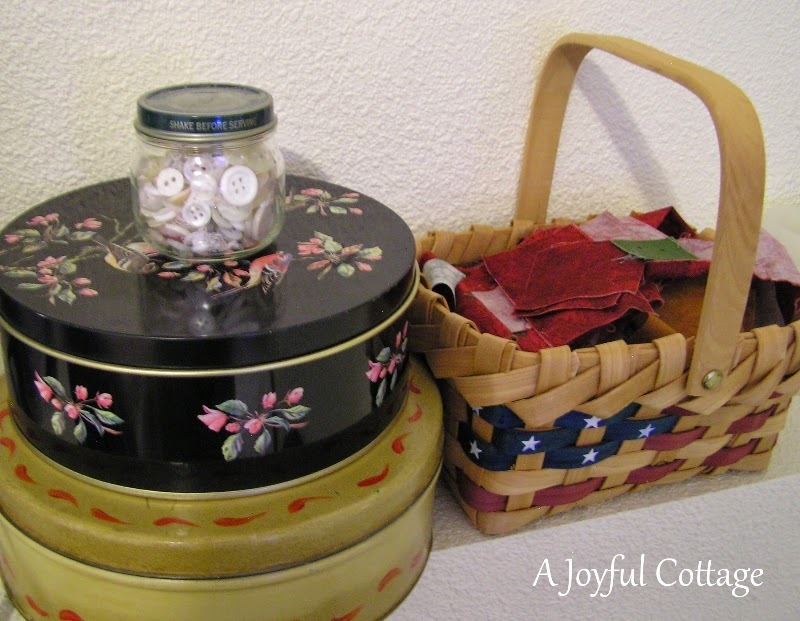 Vintage tins contain sewing supplies, and the little patriotic basket holds fabric scraps. I rarely throw away any scraps; seems I always find a use for even the tiniest pieces. My husband is a professional artist, so I never lack beautiful artwork for my walls. 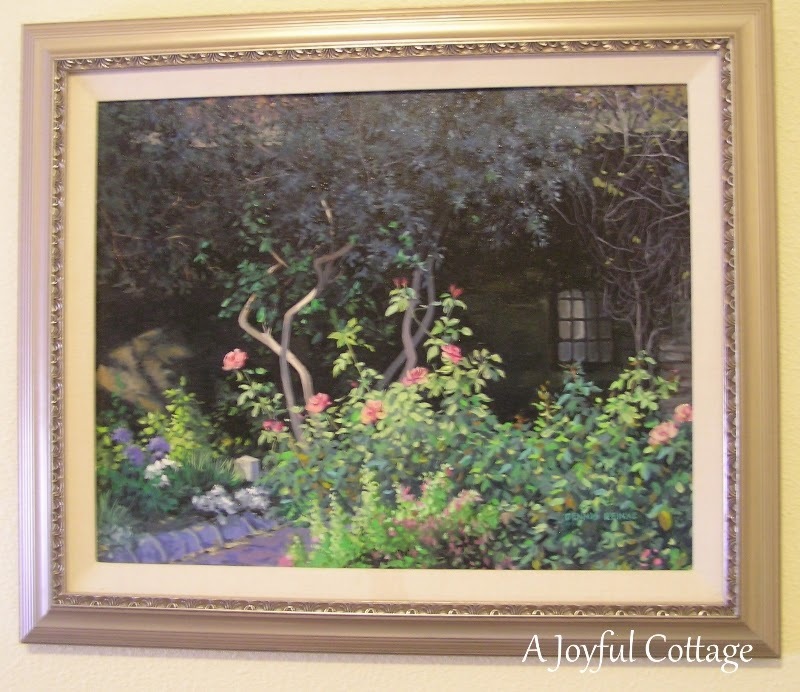 This is a print of a painting he did in San Jan Capistrano. 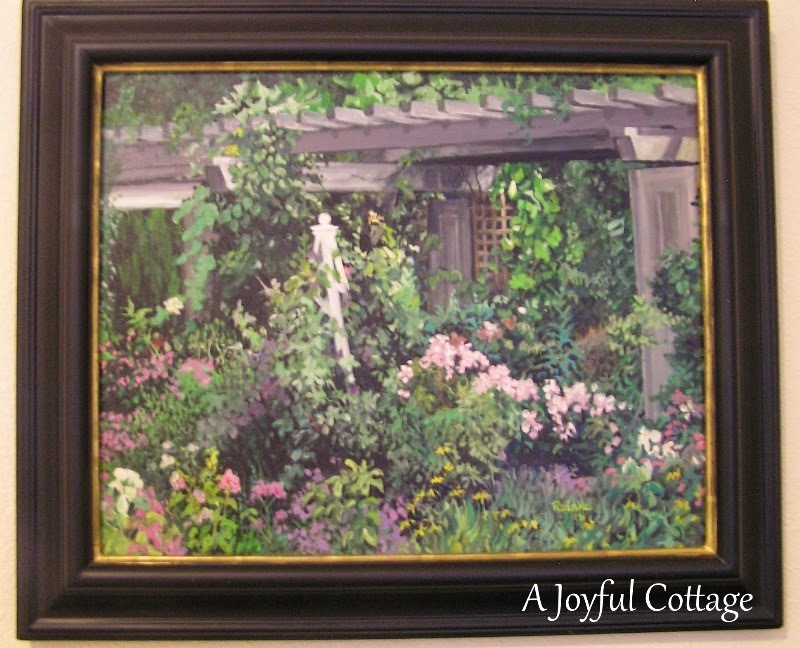 The original painting was sold. 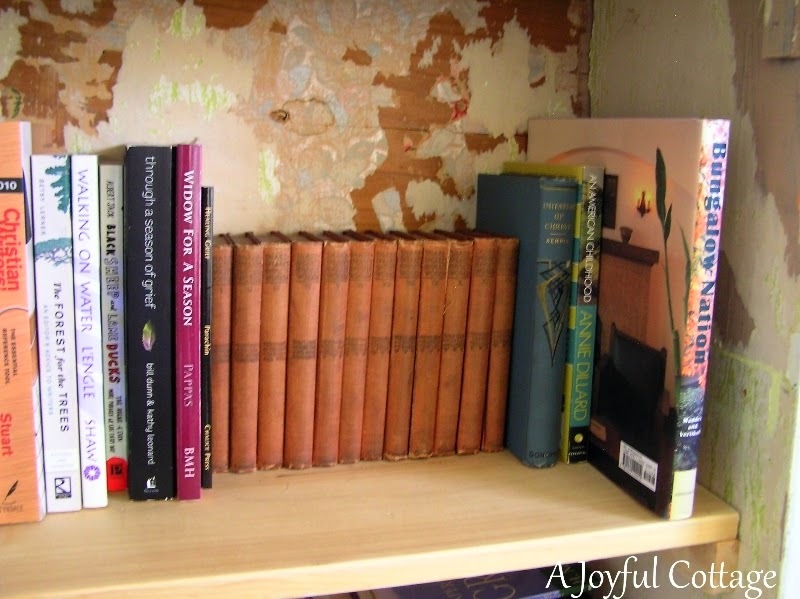 An old glass front cupboard found at a yard sale keeps my books at hand. I painted the outside, and left some wallpaper layers on the inside for fun. 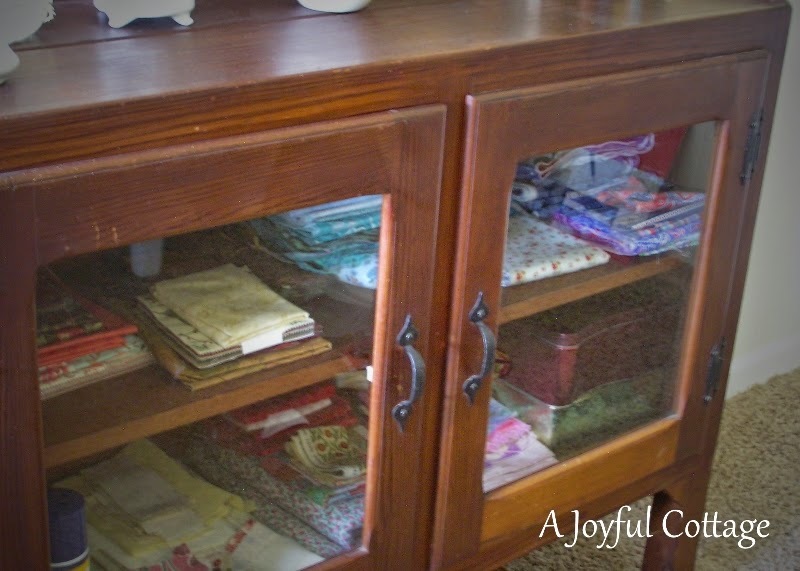 Another glass front piece is home to my quilting fabric and other necessities. A few vintage pretties rest on top. Wire cubes house baskets filled with odds and ends, home design binders and CD albums. 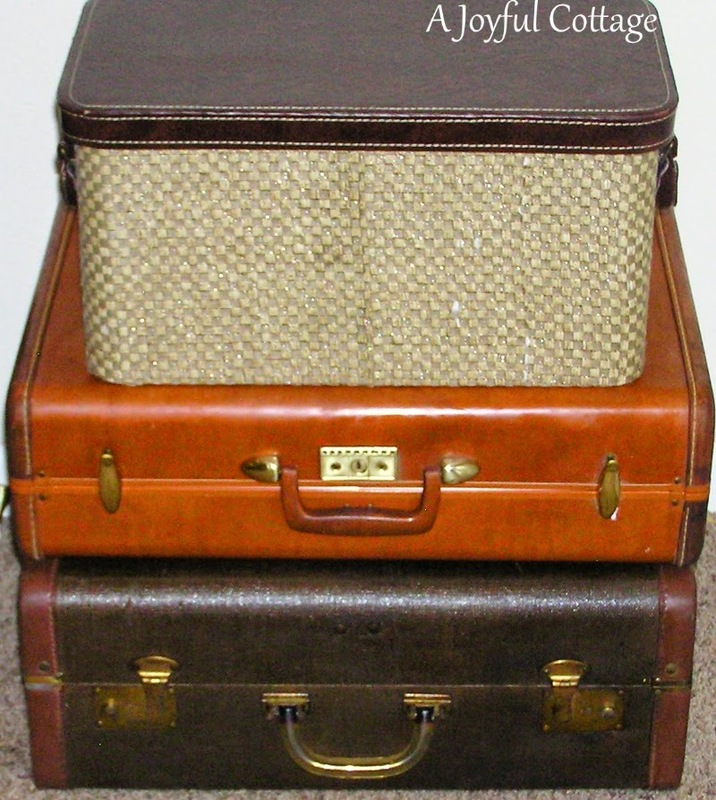 Other goods are stored in two vintage suitcases and a woven box with leather lid and handles. 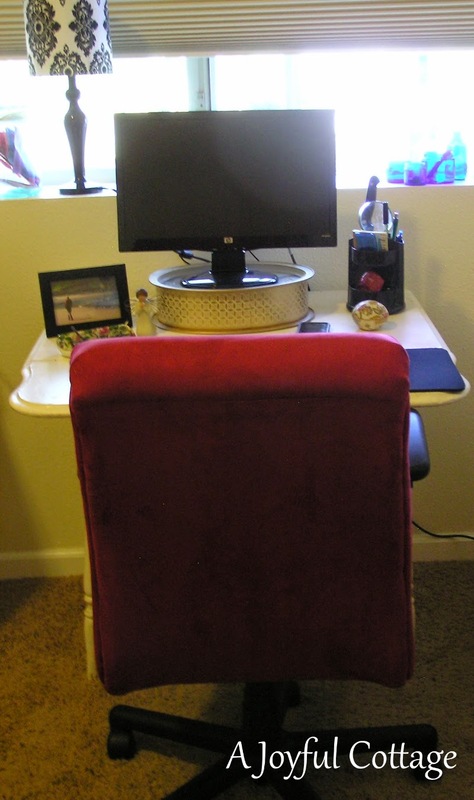 So, there you have it. . .this is where I create. I hope next year I'll be giving you a tour of my creative space in our new home. Thanks for stopping by, and do check out the other fabulous creative spaces at Karen's blog. You'll be so inspired. It's a super space, Nancy. 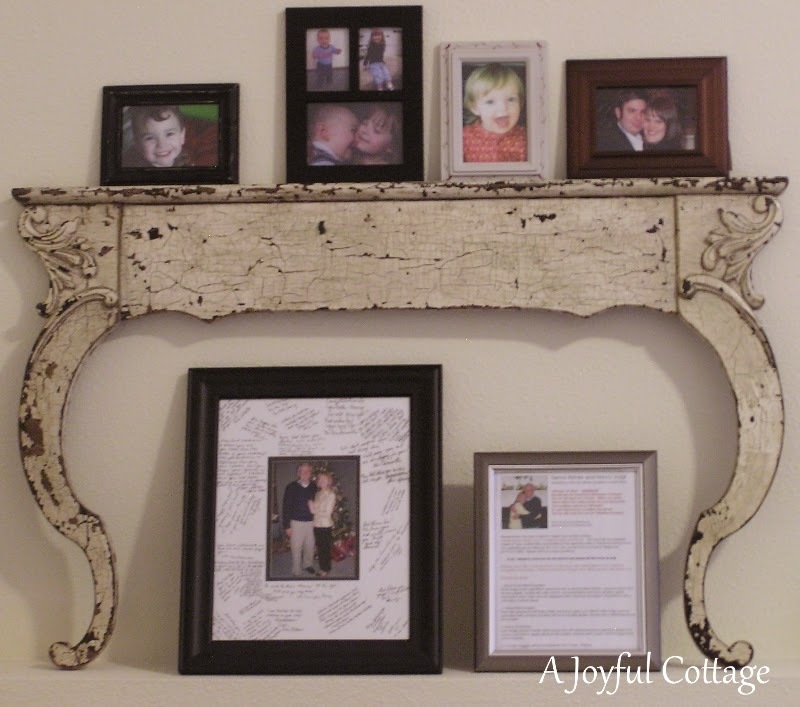 It's filled with lots of meaningful items and I always think that makes the loveliest rooms! I currently have no dedicated craft area...but I'm working on it! Enjoy your room! Great place Nancy! Especially love that chippy arched mirror piece, the stacked cases, and I loved that wall paper cabinet from the get go! Great to have a space with a wonderful view and pretty blue bottles to boot! 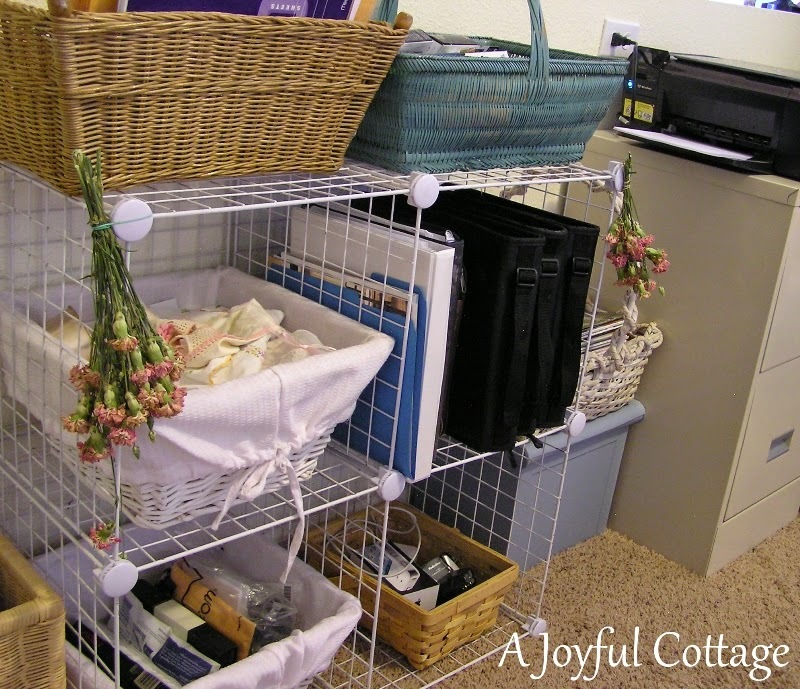 You have so many amazing pieces for storage. What a fun place to create! I did it - you are the last link at the party and I made it through them all! How very warm and comfortable you have created your apartment space to be. 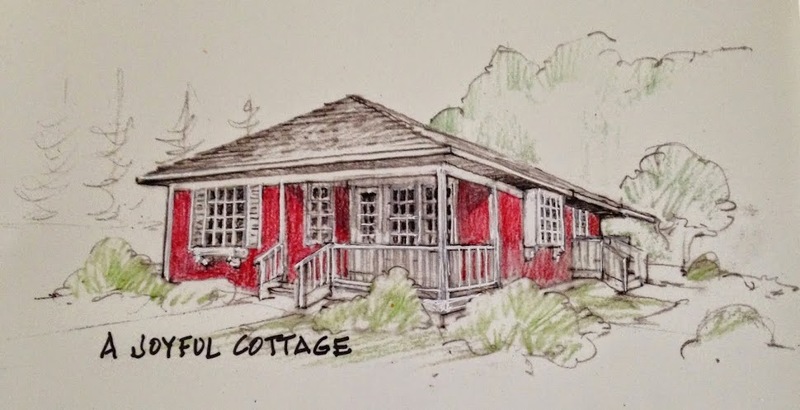 Soon all your treasures will be finding comfort in your brand new cottage. Thanks for sharing your space with us! I love that you collect cobalt blue bottles. They are so very pretty especially in a window. And I am crazy in love with the harp frame you found! Way to dig in there and find the good stuff, just beautiful! Enjoy creating! I think I'd give my eye teeth to have such a wonderful play to work and play. You've made it your own. Thanks, Sandra. The white bookcase is one of my favorite pieces of furnitue. I'm glad I joined the party this year. So many unique spaces. Hi Nancy. Your space is great. I'm also a cobalt blue fan. I hope you enjoy all the wonderful studios. Hi Helena. I'm slowly making my way through all the studios and getting so many ideas from these inspiring spaces. Thanks for stopping by! 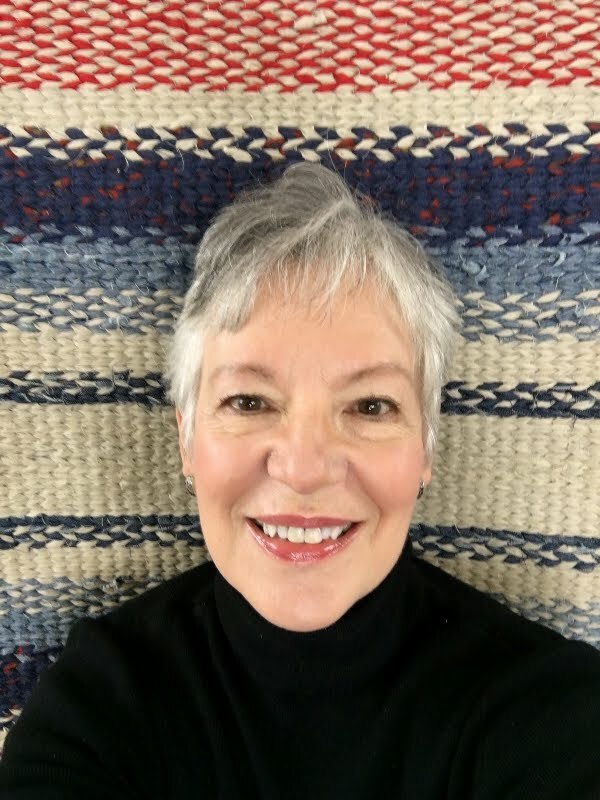 You have beautiful furniture in your studio, Nancy. What a wonderful space! What a lovely space with such a breathtaking view. Those mountains must be so inspiring. 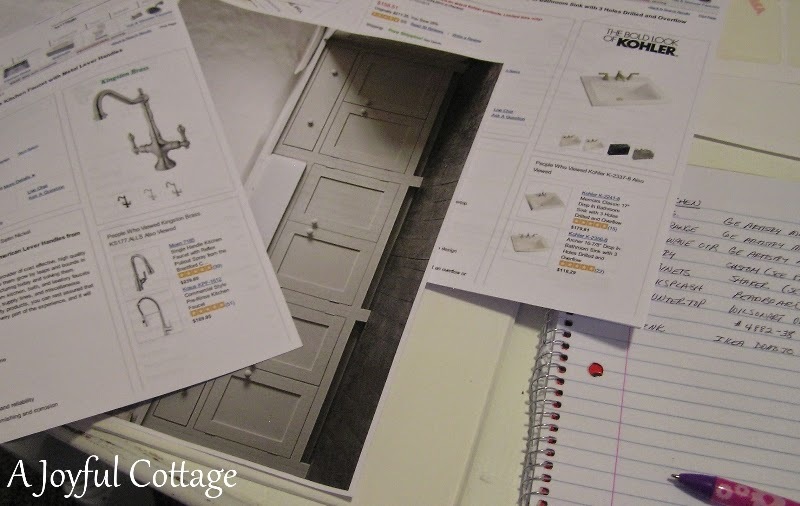 I loved seeing behing the scene of your cottage planning. That kitchen and the tap w saw are lovely. Can't wait to know more! So many lovely things, I like the old dining table you restored and the old suitcases for storage. You have a great view of the mountains from your desk, thats really neat and I bet you can see some amazing clouds growing from above the tops. Very nice space and how exciting to be planning for your new home to be. 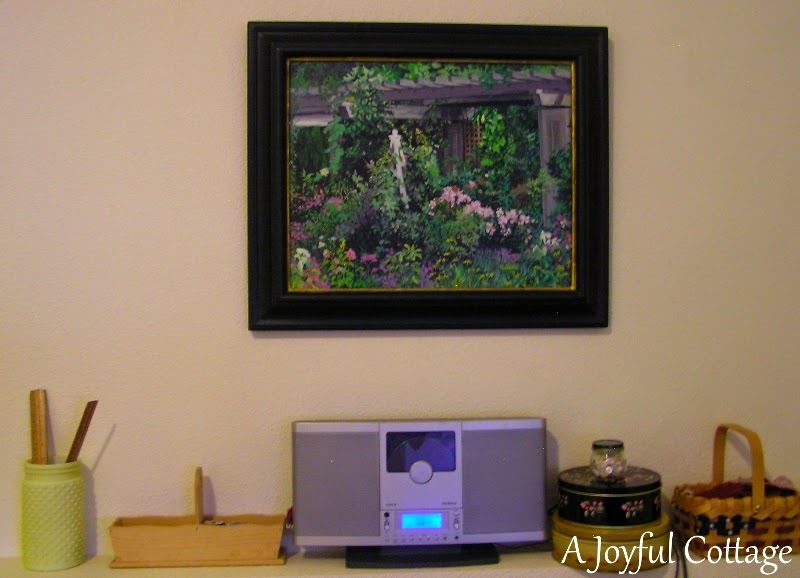 Your husbands paints are stunning! Thank you for the tour and I look forward to see what you will have to share at the next years WBC. Happy summer to you and your husband! Thanks, Susan. I'm in danger of developing an addiction to tins. They remind me of my mother, as she had so many that she used for storing buttons and whatnot. I wish I had those now. Have a great day and thanks for visiting.